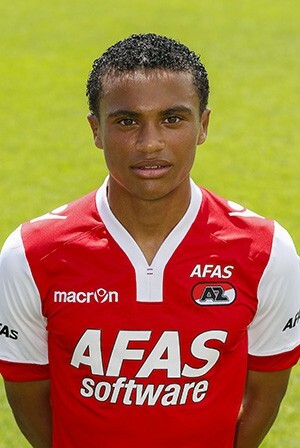 Dabney dos Santos joined AZ Alkmaar youth academy in 2009 from a small club AVV Zeeburgia. He made his Eredivisie debut on 25 October 2014 against FC Groningen. He replaced another talented youngster Thom Haye after 60 minutes in a 2-2 home draw. This is his breakthrough season and he already established himself as a first-team regular. He even won the player of the week award once, given by “Voetbal International”. He was also dubbed “the new Adam Maher” by experts and fans. It is worth mentioning that he has Cape Verdean roots, but represents Netherlands national youth football teams and now is a member of U19 setup along with other extremely talented Dutch players such as Donny van de Beek, Richairo Zivkovic, Bilal Ould-Chikh, Abdelhak Nouri and Jairo Riedewald.